While teaching home economics at Eastern Mennonite College, professor Mary Emma Showalter Eby compiled the Mennonite Community Cookbook in partial fulfillment of a master's degree at University of Tennessee. Despite her plans, it would be the only cookbook she ever published. Since 2005, EMU has been the beneficiary of the book's royalties, grossing $36,000. The new 65th anniversary edition, with a 12-page historical supplement, shares more about Eby's experiences with the bestseller. 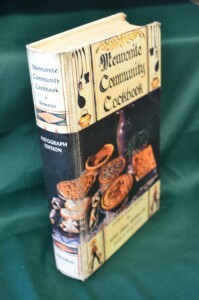 It was the first Menno­nite cookbook ever published by anything more than a local congregation or a small regional printer. People have referred to this cookbook as the “mother” or “grandmother” of all Mennonite cookbooks. Mary Emma Showalter Eby would perhaps roll over in her grave if she heard any of these quips. She’s buried at Trissels Mennonite Church cemetery near Broadway, Virginia, a church that kindled her early understandings of compassion and service, according to a tribute written by colleague Catherine R. Mumaw after 90-year-old Mary Emma died in 2003. Mary Emma lived in the Shenandoah Valley of Virginia most of her life, the oldest daughter in a family of nine children. It seems fitting that her bones now rest merely 10 miles away from the offices of MennoMedia, the churchwide agency that continues to publish her cookbook. This is the story of Mary Emma, who was much more than a home economics professor and cookbook compiler. She was an innovator and trailblazer for other women. During World War II, which impacted so many of Mary Emma’s generation, she was caught in a professional dilemma as she finished college. She had first attended Eastern Mennonite School (EMS) from 1935-37 with the goal of teaching home economics. She finished her degree at a nearby state school, Madison College (now James Madison University) in 1942, a few months after the December 1941 attack on Pearl Harbor. She wanted to begin teaching but felt that given the ardent patriotism of the war, she would be expected to support the war effort as a public school teacher. This stance swayed the professor to help her find materials to use in her work. As one of only three women among 120 men at the camp, Mary Emma also taught nutrition and craft courses. Her efforts at this one camp led to her being asked to conduct a cooking school for the other CPS camp cooks. 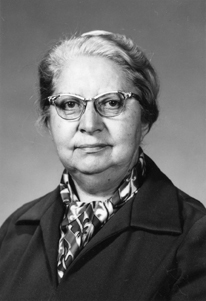 Orie O. Miller, then head of Mennonite Central Committee and instrumental in helping organize the CPS program, asked Mary Emma to visit 15 CPS camps throughout the country and evaluate camp food expenditures (42 cents a day per person was budgeted). She was to recommend any needed changes. Mary Emma told Miller she would rather go abroad to do relief work than visit all the camps. 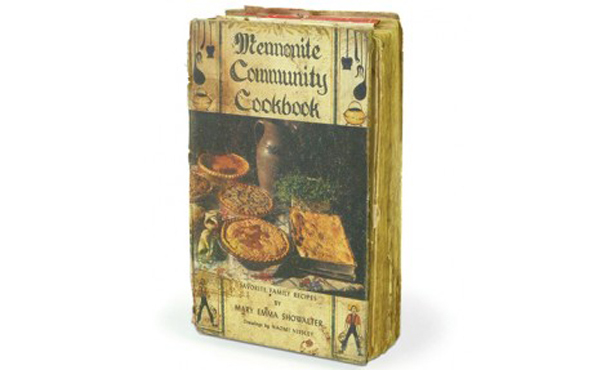 She agreed, and her visits to the camps became the seed for creating Menno­nite Community Cookbook. 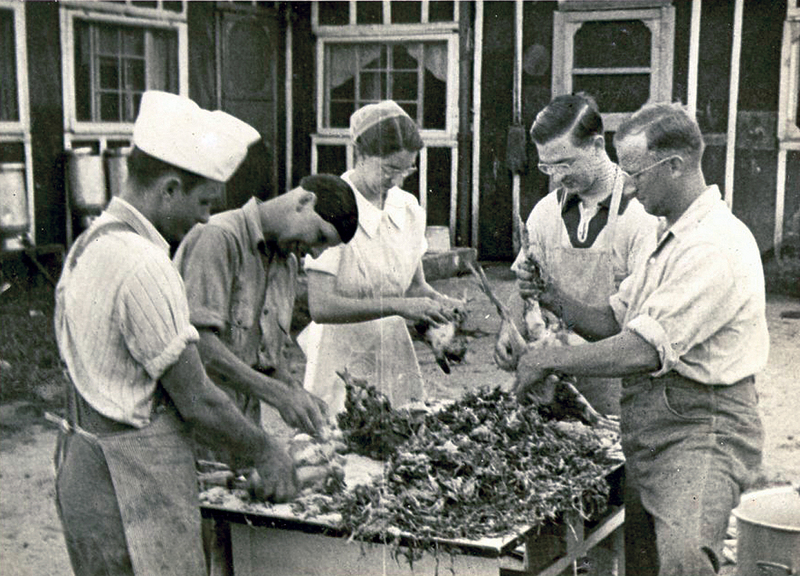 Wherever she went, Mary Emma observed that Mennonite cooking was much the same. The dishes the men hankered for came from their home communities. After the war, in 1946, she returned to the United States and sought a teaching job. Catherine Mumaw’s tribute notes that Mary Emma “was more interested in being a professional than getting married” at that point. EMS President John L. Stauffer asked Mary Emma to be the school’s dietitian and teach high school home economics, a job she readily accepted. In 1947, the school became Eastern Mennonite College (EMC), and Mary Emma began putting in motion two dreams: setting up a college degree program in home economics (for which she’d need a master’s degree) and putting together a cookbook featuring the Amish and Mennonite cooking of her generation’s parents and grandparents. After observing her mother’s old hand-written notebooks of recipes and learning that women in every Mennonite community had similar written collections, she longed to preserve that history and “compile such recipes before they were destroyed by the daughters of today [who] were guilty of pushing them aside in favor of the new,” Mary Emma writes in her introduction to the cookbook. Mary Emma also sent out letters to wives of ministers using a directory of Mennonite ministers. She asked Paul Erb, editor of the denominational magazine Gospel Herald, to run an announcement seeking recipes for desserts, salads, meats, soups, pickles and more, hoping to have each Mennonite community in the United States and Canada represented in the book. Ultimately she was able to round up 125 women to canvass their church communities and collect more than 5,000 recipes. Almost 600 cake recipes were to be tested. The chair apparently wanted to make the requirements tough: “[It was] neither logical nor scientifically related that [the professor made it a requirement for] each of the 100 cake recipes be beaten by hand rather than a mixer,” wrote Mary Emma in MWR. But she nursed her sore arms and baked those cakes, eventually choosing the 79 cake recipes now included in the book. M.T. Brackbill, a physics professor at Eastern Mennonite College, took all the original food photographs in the book. Mary Emma’s home in Harrisonburg was the setting, using her own dishes or treasured family serving plates, tablecloths and place settings. Don Showalter, a Harrisonburg attorney and Mary Emma’s nephew, recalls tasting the decorated fruit cake his mother made when he was 9 years old, which was photographed for the original cookbook. When Mary Emma first contacted Herald Press, the church publisher, with her proposal for the cookbook, the answer was pointed and now ironic: “We are not in the business of printing cookbooks.” So an ad hoc group of folks in Scottdale, Pennsylvania organized the Mennonite Community Association to move the project forward. They found a much larger publisher based in Philadelphia, the John C. Winston Company, ready to tackle the project. Later, after the book sold exceedingly well for almost 20 years, Herald Press snatched up the chance to become the publisher. This move greatly satisfied Mary Emma because of her lifelong dedication to the Mennonite church. Mary Emma felt comfortable among friends in Lancaster County, but the planned events and interviews in Philadelphia made her a little anxious, especially when she learned she was being asked to be on TV. The John C. Winston Company went all out when they launched the cookbook in 1950. Numerous tales of the publicist’s demands on Mary Emma are told in the new 12-page historical section in the 2015 edition of the book (such as baking 2,000 cookie samples to send to magazines and reviewers). They also sent her on a short author tour, including Philadelphia and Lancaster County, Pa. So she was delighted that Naomi Nissley, the artist who drew the original cover and interior food and scenery sketches, was happy to accompany her. Naomi had gone to art school in Philadelphia. At Wannemakers, one of the largest department stores in the city, there was a huge poster on the street with both their pictures announcing the autographing party. Later, when Mary Emma visited New York City, she inquired of a clerk at Macy’s whether they carried Mennonite Community Cookbook. Seven years after the book came out, in 1957, Mary Emma became the first Eastern Mennonite College faculty woman to earn a doctorate. Doris Bomberger and Catherine Mumaw were the first two women to graduate from the home economics department that Mary Emma started at Eastern Mennonite College. Catherine Mumaw passed away in July 2014, while Doris Bomberger continues to live not far from where much of this Mennonite history happened. Both Catherine and Doris served as chairs of the home economics department at various times, as did Mary Ethel Heatwole, another student of Mary Emma’s. Some of Doris’s stories reveal intriguing tidbits into the personality and character of Mary Emma. Doris says she and Catherine took an “advanced cooking” class, and even though Mary Emma said their work demonstrated they had learned the material, they could only muster a B+ out of Miss Showalter. “She was a strict teacher, who didn’t give out A’s,” Doris recalls. But Doris, an educator and artist, holds no grudges, knowing that high standards frequently pull the best out of students. But one day, when Doris cooked, she says, “I put an egg yolk in the garbage after using just the egg white. Mary Emma wanted to know, ‘Why did you do that? You could have saved it and used it later. That’s wasteful.’ ”Doris also lived with Mary Emma for a year—in the same house where Mary Emma prepared the dishes for the now historic cookbook and where M.T. Brackbill photographed them. Doris did the cleaning, laundry and ironing as a maid to help pay for her board. Mary Emma did most of the cooking, and they ate meals together. 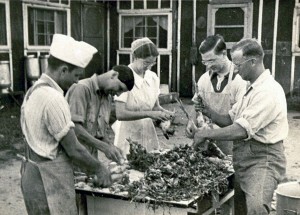 Mary Emma and others dressing chickens at the Grottoes, Va., Civilian Public Service camp. Catherine Mumaw said Mary Emma was a “person who could laugh at herself,” which likely was what was behind her rejoinder to the found money. Indeed Mary Emma was dutifully proud of her first two graduates from the EMC home economics department she founded, “almost as proud as if you were my daughters,” she said. Both women received an autographed, tabbed copy of the cookbook as their graduation gift, which Doris still uses and holds dear. Later on, Catherine, Doris and Mary Emma were all graduate students at Penn State University (State College, Pennsylvania) and lived together in a rented house more as equals. Catherine and Doris were working on master’s degrees, and Mary Emma was finishing her doctorate. One escapade there raised the ire of their roommate. Catherine and Doris got into a landlord’s cedar chest, found a wedding gown, and one of them modeled it. When they showed it to Mary Emma, she was horrified, not wanting them to get in trouble with the landlord. But they all stayed collegial friends. Doris helped host a small wedding reception in her home when widower Ira Eby of Hagerstown, Maryland married Mary Emma in 1960. Although Mary Emma never had children of her own, her stepdaughters, Phyllis of Broadway, Virginia, and Eleanor from Harrisonburg, and stepson Robert of Scottdale, became like daughters and son. The family treasures not only the cookbook—especially in its original hardback form and original photos—but are also guardians of Mary Emma’s diaries and dishes they inherited from their renowned stepmom. They have also made sure all the cookbook royalties continue to go to the school where Mary Emma first felt called to teach, what is now Eastern Mennonite University. Mary Emma dreamed of writing another cookbook and had started on one, but it never “sufficiently crystallized.” She was happy to write an introduction for More-with-Less Cookbook by Doris Janzen Longacre. She also considered starting a restaurant featuring Mennonite cooking and even inquired whether using the name Menno­nite Community Restaurant in the name would be permitted. Longtime Herald Press book editor Paul Schrock responded to her letter saying, “We think this is a delightful idea that should enhance rather than detract from the sale of the cookbook.” Unfortunately, that never came to pass, either. Mary Emma’s life and legacy went beyond being a well-known cookbook author and home economics teacher. Her lived faith, sparked by the teachings of her church and family, refined in the maelstrom of World War II and lived out through her long service at a church college, benefited the church, the larger world and countless families. After selling nearly a half million books, she also likely saved a few meals for many a confused or harried cook. There are many more stories about Mary Emma’s experiences launching and promoting Mennonite Community Cookbook. What should she do when asked to wear makeup and be on TV—a medium still forbidden at that time in Virginia Mennonite Conference?